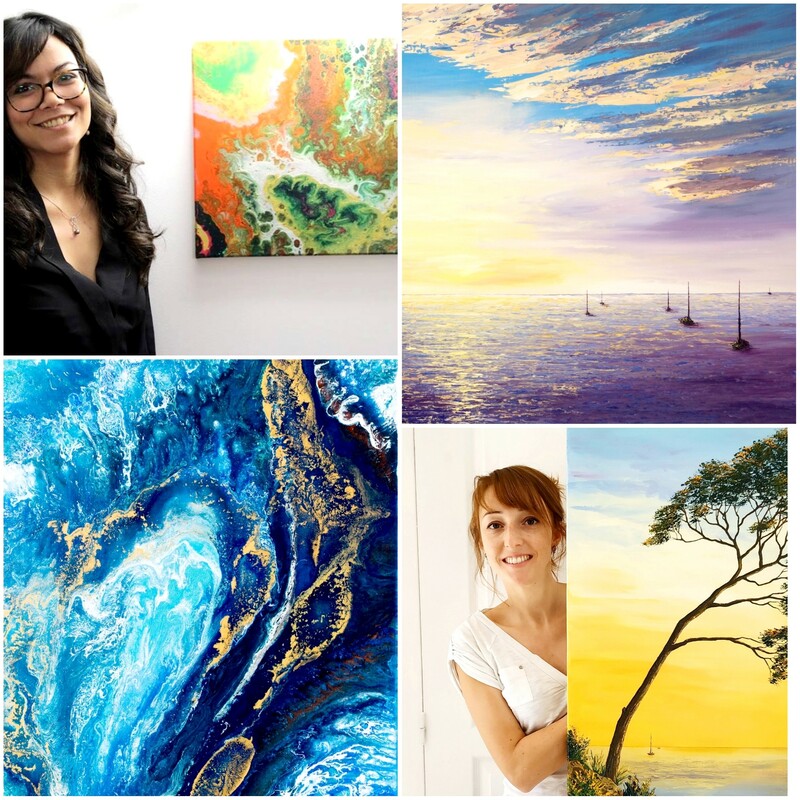 Two artists, two styles, but one passion! What is this challenge about ? One could say we have completely different styles, yet somehow, we have found a way to create a harmonious duo on the canvas. 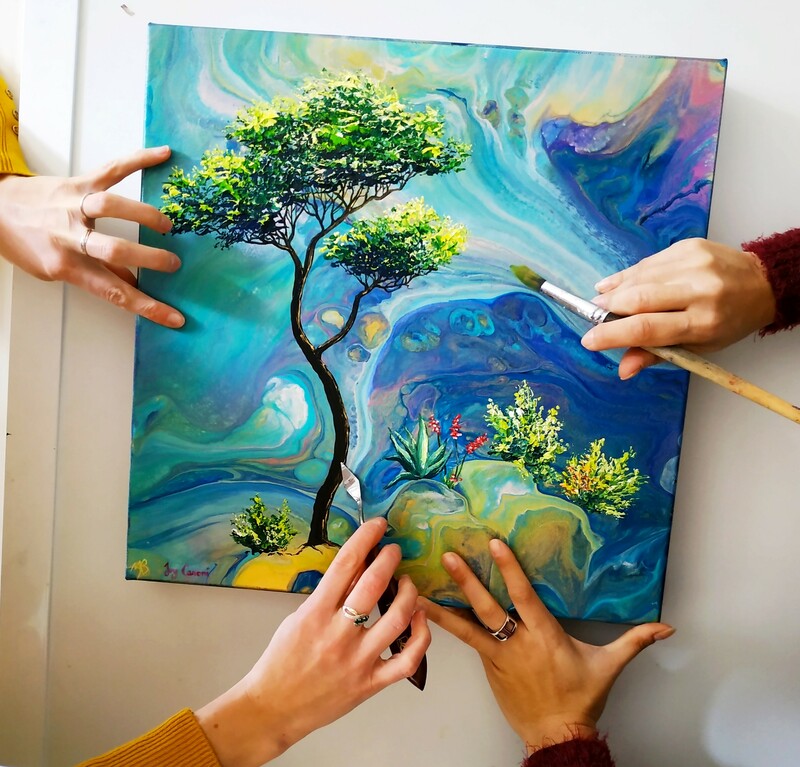 This art challenge consists of two artists, working together with their four hands on the same painting. 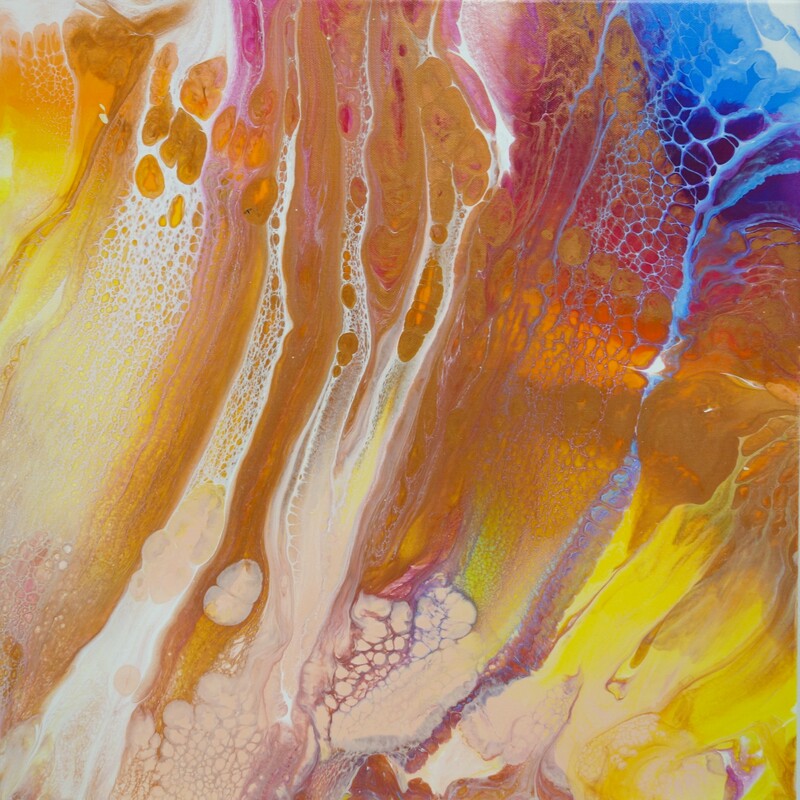 Joy Caroni starts the painting in her abstract fluid acrylic style, also known as ‘paint pouring’. Once the canvas has dried I pick up the piece. 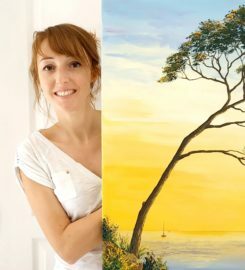 Using the colors and shapes already formed I gain inspiration to add my personal style, oil knife painting. With my knife I create something unique that blends the two styles perfectly. 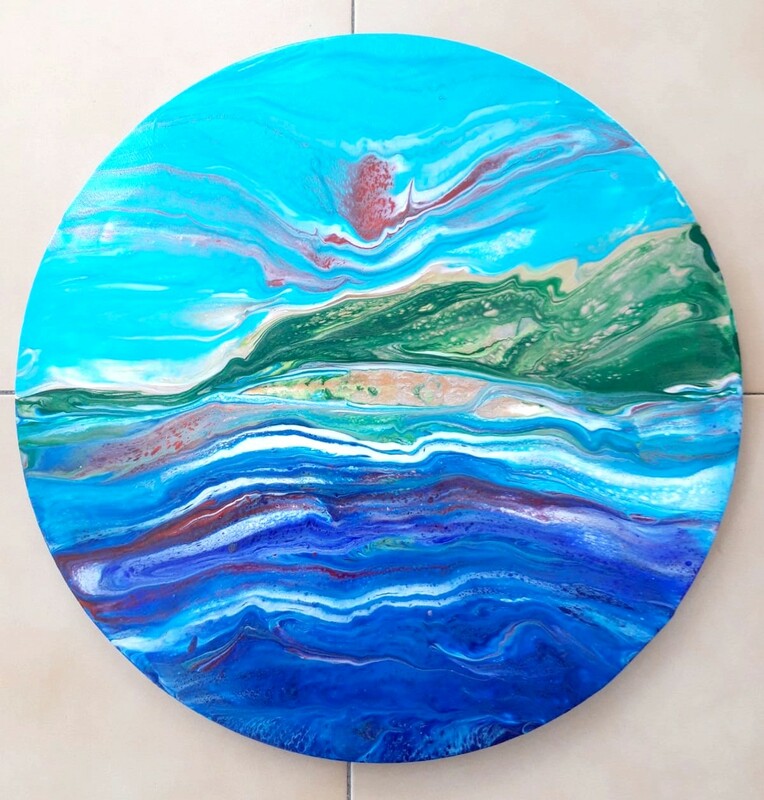 The idea is that each artist is free to create in their own technique, knowing that we are working together to create one piece of art. The idea is also for both of us to step out of our comfort zone and push our creativity to a new level. 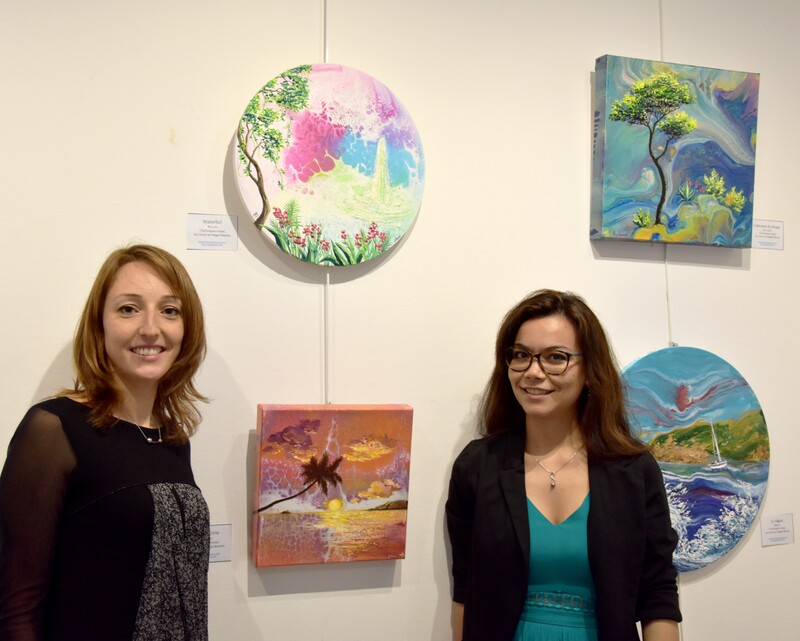 The second part of the collaboration was to have a joint art showcase—of both our works—Joy Caroni and her abstract style, and me with her landscapes—in the same hall, the idea being that both artist are inspired by nature and its colors. 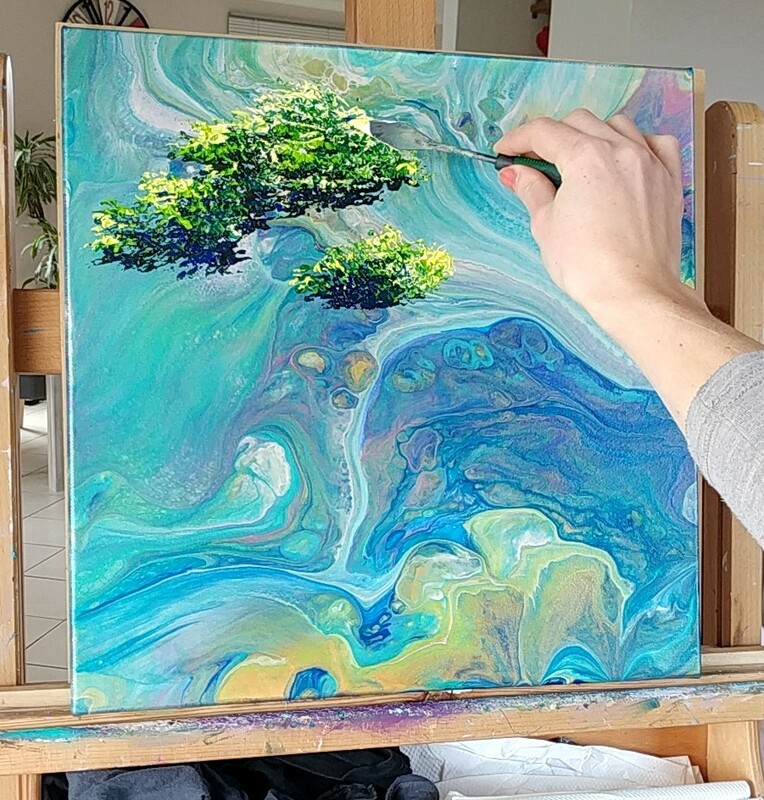 After the first try of creating an art piece with two completely different styles, the results were not only surprising from the positive feedback the public gave, but also beautiful. The first trial was a success and a wonderful collaboration was born. We then decided to create more pieces together in order to have a couple pieces for our joint art show. As the project advanced, we shared it on social media every Tuesday for our subscribers to watch the progress of each piece. Every Tuesday for 2 months we shared our progression. A practice of ‘letting go’ and enjoying the process and what may come of it. To this day we have created 6 joint art pieces signed by both artists. 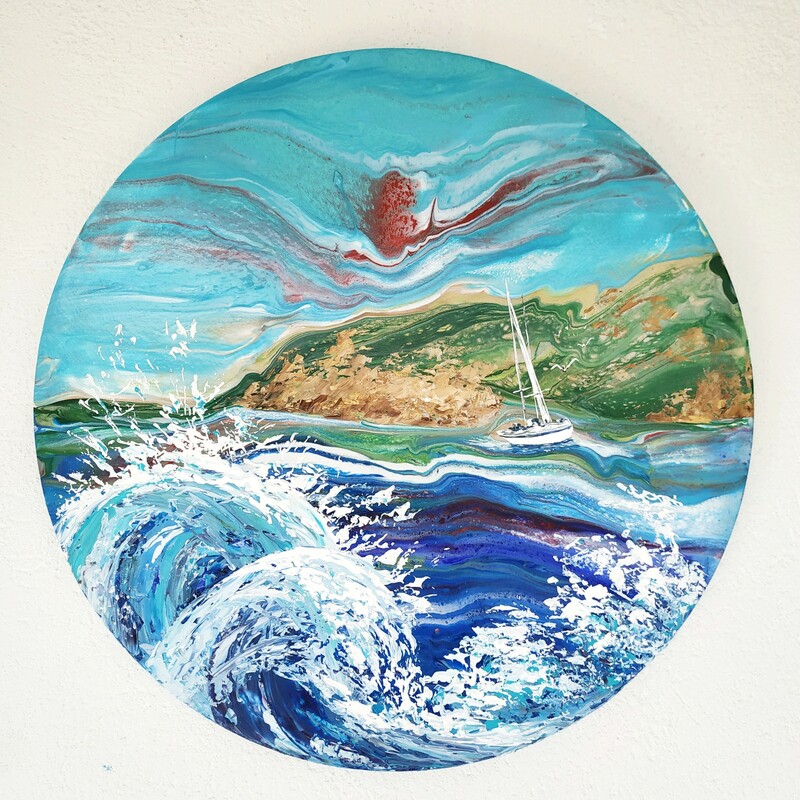 Joy works with acrylic paint and is inspired by her emotions of the moment. 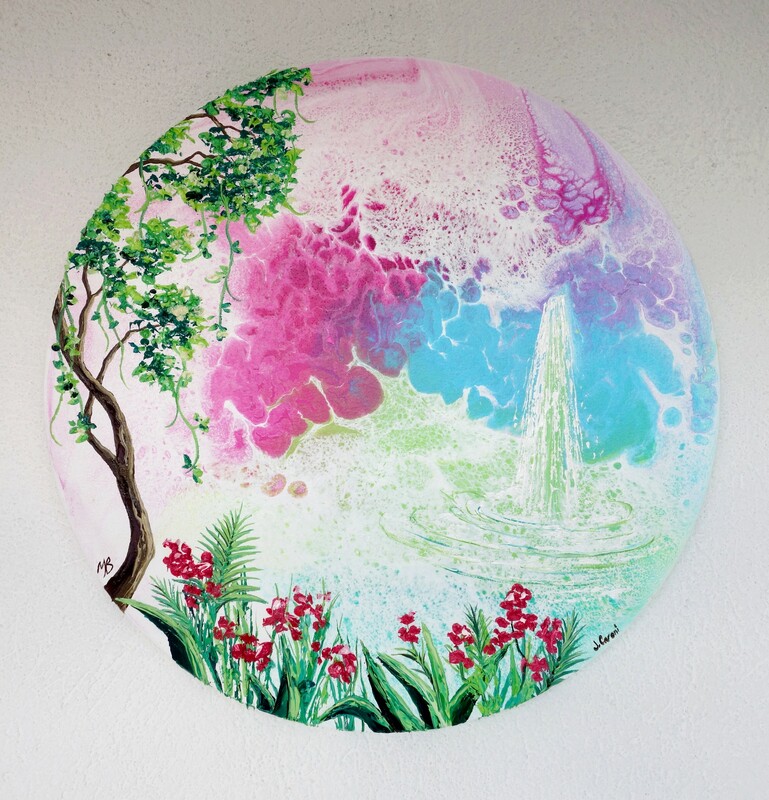 She has always adored practicing different forms of art and is completely self-taught. 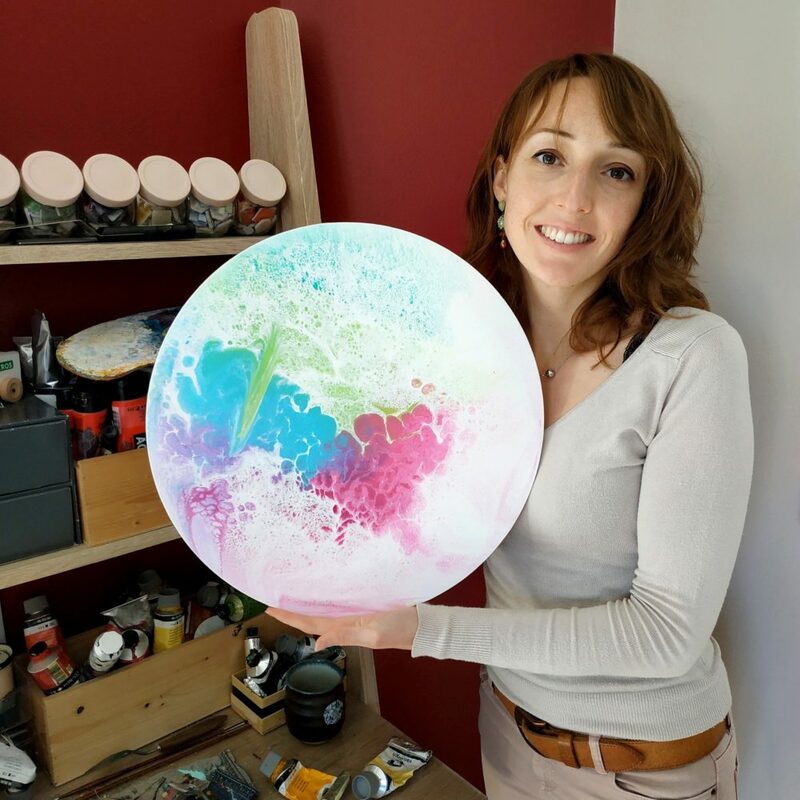 She has been practicing her art for years before finally taking the leap to launch her professional art business, last year in March 2018. She is determined to make her dream of being a professional artist come true. 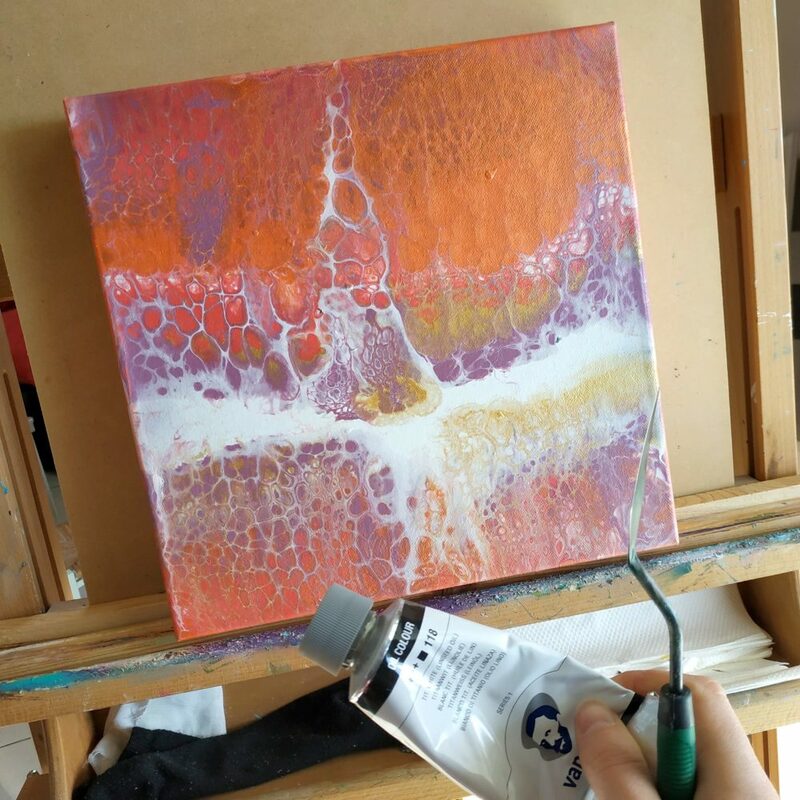 My technique is oil painting with a knife. 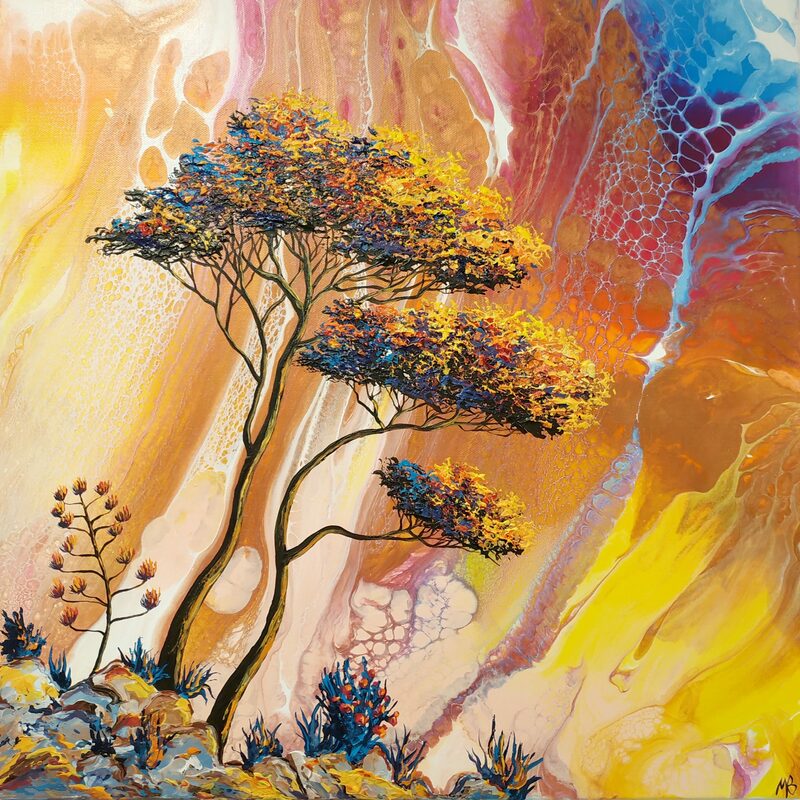 I am inspired by nature, colors. And especially love trees. Also, self-taught, as a teenager, I have been practicing and perfecting my technique while also advancing in my career. I worked for a company doing import/export before presenting my work to an art Gallery and I started doing solo art shows. I gained my professional title of artist in 2014 while juggling my other profession, and finally in March 2018 left it all to be a fulltime professional artist. Is it a coincidence for us to meet? Or was it fate? A couple months later Joy and I meet up for the first time. We realize just how much we have in common and all the passion we share for our profession as new entrepreneur-artists. Joy first met my sister who then put us in contact when realizing how we had several things in common, our age, our professional dates, and our passions all coincide! Joy and I decide to meet for coffee, and things took off from there. We couldn’t wait to meet again. We had so much to share. Each one’s unique journey that brought us to this unique moment in time to collaborate. We share advice and help keep each other motivated. End of 2018 we decide we would love to collaborate and show case our art at the same time. Even though we have two completely different styles something clicks, and it feels right for both of us. Both me and Joy believe that artists don’t’ need to be in competition with each other but instead can both bring each other up. Instead of stealing the spotlight, their idea is that each artist brings her own spotlight to better illuminate each other’s work! 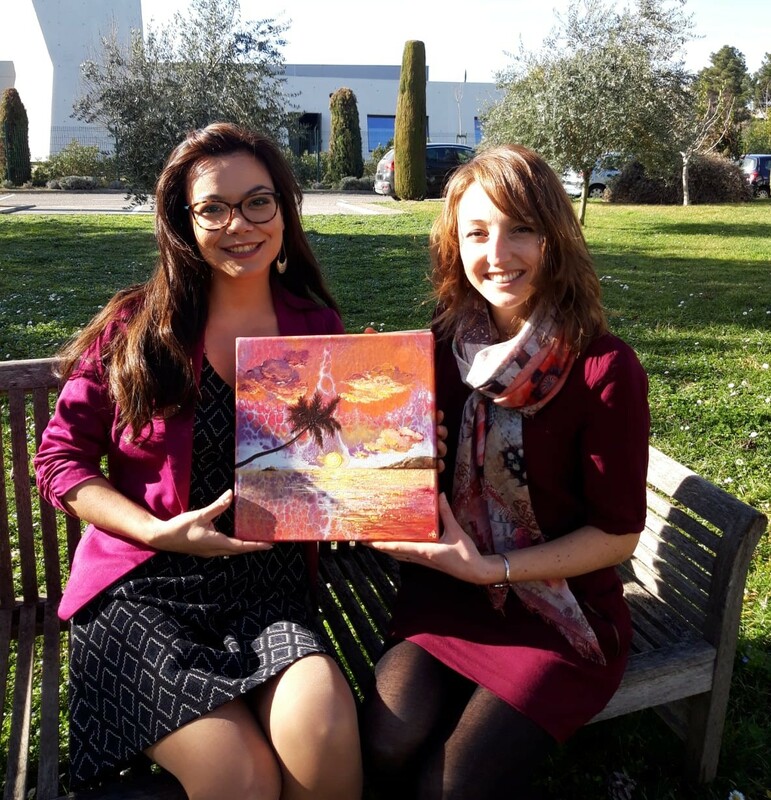 Joy and I are looking forward to working together on future projects and will continue our joint painting experience. Stay tuned for future events!